We weren’t involved directly with the costumes ourselves which would mean that the costume would have been purchased in one of the stores stocking our things at the time. 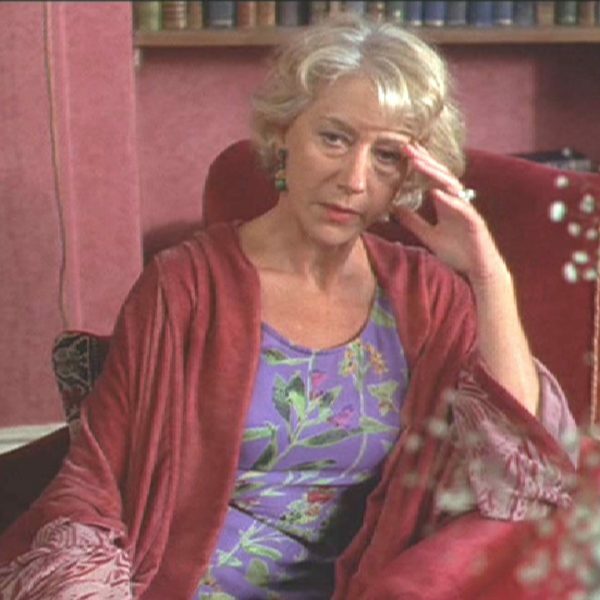 Helen Mirren is seen wearing a jacket which she wore over a flowery dress which was not one of our creations. She also had a jacket with pleated dress. In some scenes she wore the pleated dress on its own too. Interestingly we were involved with the journalist who wrote the original article that inspired the making of the film. Paula Deitz owner and editor of the Hudson Review, is a long time friend and colleague. Paula came over from America to visit Leyhill Prison to meet the inmates who won awards in the Hampton Court Flower Show. She came to visit us on the same trip. The inclusion of our clothes was actually a completely coincidental thing completed unrelated to our relationship with Paula. It was just one of those occasions when things flowed naturally. Bizarrely there was another coincidence when Georgina, Charles and Patricia’s daughter visited the film website and signed up to receive news and updates about the film. This automatically entered her into a prize draw competition which she then subsequently won giving her two posters of the film signed by the leading actors featured in the film.